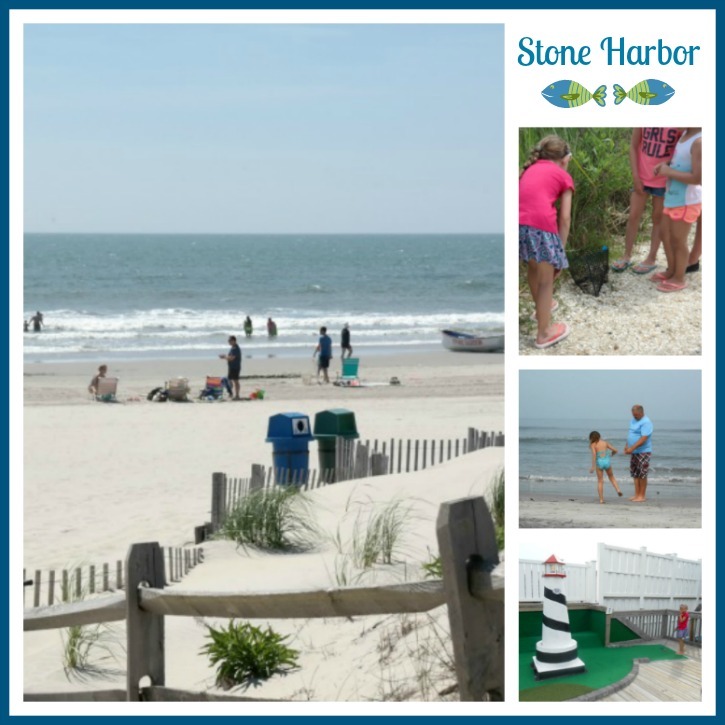 During the summertime we like to take a few weekend getaways and recently we had to the opportunity to visit Stone Harbor in New Jersey. Since Stone Harbor is only a 3 hour and 45 minute drive from our home in Pennsylvania, we decided to take our 8 year old granddaughter along with us. Stone Harbor is a great family-friendly Jersey Shore destination that offers a lot of fun things to see and do while you're there. We spent three days and two nights enjoying some fun in the sun. Here's some of the things that we did. The Beach: The beach here is wide, beautiful and sandy. With that said, you do have to buy beach tags to spend time out on their beach. Each day we spent approximately 3 hours soaking up the rays and playing in the water. Luckily for us...the weather was absolutely PERFECT all weekend long. Miniature Golf: Early one evening we headed downtown to play mini golf at a place called Club 18 which is an 18 hole miniature golf course. The course is totally decked out in an animal theme and is fairly easy to play. With that said, if you have mobility issues or have toddlers with you, this may not be the course for you. You'll have to climb a lot of stairs and they don't offer a lot of places to sit down. Shopping: Each evening we headed downtown to do some shopping. Unlike some of the other Jersey Shore destinations, Stone Harbor doesn't have a boardwalk. With that said, they have a downtown business district where you can shop at different gift stores, candy shops, boutiques, etc. You'll find cafes, ice cream parlors and restaurants along the way. Wetlands Institute of Stone Harbor: Right before you come onto the island you'll find The Wetlands Institute in Stone Harbor. This educational & research facility teaches you about the coastal plant life, marine line, local conservation and so forth. We took the guided safari marsh tour and afterwards we enjoyed staying for the touch-tank and marine animal feedings. You'll want to wear comfortable walking shoes and dress appropriately since you'll be doing your walking outdoors. If you plan on visiting them, you'll want to allow about 2 hours in your schedule. The tour starts off with a 17 minute mini movie on conservation and then the safari marsh tour will begin. The marsh tour took approximately 30-40 minutes to complete. Every day they feed the crabs, skate, fish, octopus, etc in their aquarium building around 3pm and you can stay around to participate in that. The Water Tower: If at any time you're looking for public restrooms while doing outdoor activities in Stone Harbor, you'll want to look for the super-tall water tower. That's were you'll find a big building that houses public restrooms. It's within walking distance from some areas on the beach and from a lot of the different areas in the downtown business district. 1. 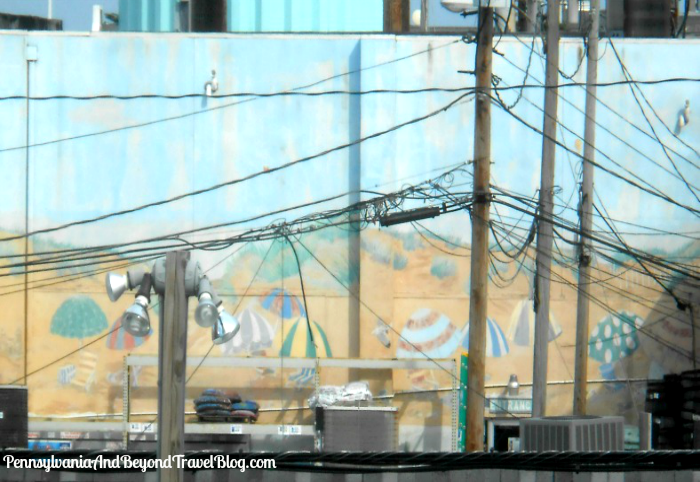 The first one is a hand-painted wall mural by artist David Dunleavy (one of our favorite coastal artists) and it's painted on the side of a large building as you come onto the island from the main drag. It features Atlantic Blue Marlins feeding in the Atlantic Ocean. 2. The second one is a hand-painted outdoor wall mural that we spotted on the back of the Ace Hardware Store in Stone Harbor. It's pretty faded and needs to be touched up and restored. I have no idea who the artist is/was due to the fact of all of the gardening & landscaping supplies blocking some of the view. Regardless, I wanted to include it because I loved the overall beach scene. I tried to find some information online about it, but came up empty-handed. We crammed quite a bit of activities into our little weekend getaway to Stone Harbor in New Jersey and hope you enjoyed a taste of some of the things that we did. If you're looking for a family-friendly Jersey Shore destination, we highly recommend Stone Harbor!